Getting your canine companion fed is one of the most important parts of dog ownership. While most don't realize it, every aspect of your dog's day and overall health revolves around meal time. Not only do you have to put some time into finding the right food that fits your dog's nutritional needs, but you have to pay the recurring costs of food, invest in feeding dishes, schedule feeding times, introduce training, and so much more. All of these factors are directly related to your dog getting some grub. While most experts and dog enthusiasts can agree upon the basics of feeding, there is one point of contention that often leads to a heated debate. That area of discussion is how your dog eats. More specifically, whether or not your dog should use an elevated bowl. 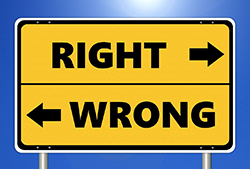 There are differing opinions on the topic due to numerous studies with conflicting data. Some owners think that elevated dog bowls are a must-have for avoiding potential problems while others think that using these bowls is a direct cause of the problem. So which side is right? What Exactly is an Elevated Dog Bowl? 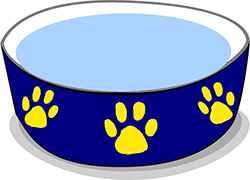 As the name implies, elevated dog bowls are raised above the ground. They come in a wide variety of styles and materials. However, most have the same design principles. They hold your dog's food and water bowl up off the ground so that they're easier to access. Most come in a fixed height, so owners must perform a few measurements to find the right model for their pup. Some can also be adjusted to meet the needs of a growing puppy while others include storage space for kibble. Regardless of the design, they're meant to take the bowls up off the ground so that they're at the same approximate height as the dog's shoulders. This is meant to reduce strain and prevent your dog from having to put their head down to eat or drink. While the pros and cons of using elevated bowls typically revolve around larger dog breeds, products do exist for small breeds. When raised bowls were first introduced to the commercial market, they were touted as being a product that could reduce the chances of a dog experiencing bloat. Officially known as gastric dilatation and volvulus, or GDV, bloat is a very serious condition that can be fatal if it's not addressed in time. It occurs when gas causes the stomach to inflate too much. The stomach then turns, preventing the gas from escaping. Within hours, the issue can prevent blood flow, resulting in death. There are many reasons why bloat happens. Typically, it happens when the dog has eaten a lot of food in a short period of time. It can also occur if the dog is active directly after completing their meal. While these causes are generally agreed-upon, the exact circumstances that lead to bloat aren't crystal clear. The relation between elevated dog bowls and bloat is a highly debated topic. While they were initially made to combat bloat, information that has come out about elevated dog bowls since then has caused a lot of confusion. A statistical study by Purdue University in 2004 argued that raised bowls actually increased the risk of bloat. However large studies say the exact opposite. There's even published information prior to the Purdue study that recommends feeding large dog breeds from elevated dishes. Needless to say, the contradicting information about the safety of these bowls makes it difficult for owners to find the right answer. Truth is, there is no exact answer. The two main studies that owners often reference are not perfect. There's no empirical evidence to support one side of the argument over the other. With that being said, there have been studies that link other factors to bloat. These include stress, environmental factors, feeding schedule, and spine issues. Many dog owners have seen success feeding their dog from elevated bowls. They're used by thousands of dogs without any issues. As a result of the information available, it's generally accepted that the main ways to prevent bloat are to separate meals, use accessories that slow the dog down, and to avoid physical activity for 30 minutes to an hour after eating. Of course, you should always monitor your dog after eating and keep an eye out for any telltale signs of bloat. These include a noticeably inflated stomach, vomiting, signs of pain, pacing, and difficulty breathing. If any of these symptoms occur, you need to take your dog to a veterinarian immediately. Is a Raised Bowl Right For Your Dog? Whether you choose to use an elevated dog bowl or not is a matter of personal preference. There are many advantages and disadvantages to consider. Before making the switch, see how your dog eats and make note of any issues that an elevated bowl may address. One of the biggest advantages of raised dog bowls is the posture it puts your dog in. When food and water bowls are placed on the floor, your dog has to bend their neck down to eat and drink. While this is no problem for small breeds that are already close to the ground, it can be an uncomfortable position for large or giant breeds. The issue is even worse with senior dogs or those that are suffering from arthritis. Lowering their head that far can cause immense pain. With raised bowls, the strain on their neck, shoulders, spine, and hips is reduced dramatically. It's easy on the joints, allowing your dog to eat comfortably. Excited eaters are notorious for pushing their bowl around during feeding time. Standard bowls slide around without a problem. With an elevated bowl, that problem is virtually eliminated. The sheer weight and design of the frame prevent sliding. Not only that, but the corrected posture also makes it difficult for your dog to push the bowl with their nose. It's not uncommon for dogs to adopt unwanted feeding behaviors. They may have a habit of splashing around in their water bowl or pawing at the rim of their food bowl. These behaviors can cause some frustrating messes. 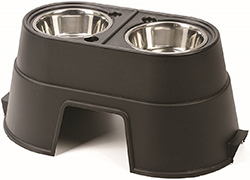 With an elevated bowl, your dog won't be able to physically play with the food or water. There's nothing worse than finding ants or roaches in the dog bowl. While it's certainly possible for these pests to climb their way up the sides of an elevated bowl frame, the chances of that occurring are very slim. When you're shopping for elevated bowls, you'll quickly find that these products are significantly more expensive than a simple metal bowl that you can place on the ground. The higher price tag is a direct result of the extra design and materials used to create the platform. If your puppy is still growing, you may also have to invest in a few different sizes so that your dog can eat comfortably. There's a common misconception that elevated bowls reduce the chances of your dog making a mess. At the end of the day, dogs are still messy creatures. A raised bowl won't stop water splashes from occurring and it won't keep the kibble contained any better. Due to the way dogs eat, messes will still happen. If you've decided that your dog can benefit from an elevated bowl, you have plenty of options to choose from. However, before you pick one up, you'll need to take some measurements. Accurate measurements will ensure that you choose a right height for your pup. Your investment will be pointless if your dog has to still bend down too much to eat or if they can't even reach the food. Luckily, getting measurements is fairly simple. 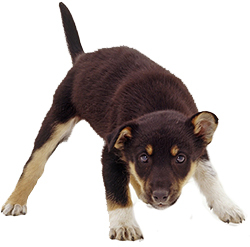 Have your pup stand up and measure the distance from the floor to the bottom of their chest. The rim of the bowls should be about where their front legs meet their chest. This puts the food and water at an ideal height. To help you on your search for the right product, here are a couple of great options. 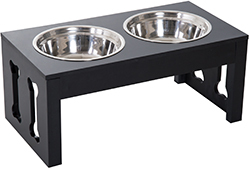 This elevated feeder from PetFusion is sleek, modern, and stylish. The frame has a simple design that can blend in with your existing decor. It's made of bamboo and is stained to take on a dark wood finish. On top of that, the wood is covered in multiple protective coats. The coating is water-resistant. This helps to keep the frame in good condition despite spills. On the bottom, rubber feet are used to prevent slipping. The feeder comes in two sizes. You can get it with a height of 10 inches or 4 inches. They come with two stainless steel bowls. The 4-inch version also has a third bowl as an added bonus. From OurPets is this plastic elevated bowl set. The body of the product is made of a thick plastic. It has a somewhat conical shape. The bottom is wider than the top. This helps to provide stability and prevent tipping. The bottoms also feature convenient cutouts for easy lifting. It's available in three heights. These include 4, 8, and 12-inch. Two stainless steel bowls are included. They can hold up to 5.5 cups of kibble regardless of the height you choose. Small finger holes are molded onto the top so that you can easily lift the bowls out. One unique thing about this feeder is that you can remove one bowl and insert a 2-liter bottle into a designated hole to create a large water supply. 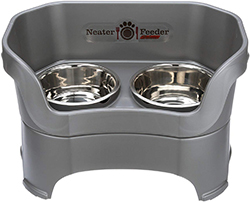 This unique feeder is available in three different sizes to accommodate the needs of your dog. It's made of plastic and comes in five different colors. These include a neutral cappuccino brown, stylish cranberry red, and distinct camo green. The feeder features a large backsplash that's designed to contain messes a bit better. There's also a drainage system on the front. When your dog splashed up water, it flows down the drain and into a reservoir below the stainless steel bowls. The reservoir is designed to keep water off the floor and can be emptied in the sink. Also Read: Eating Expired Food! Does it Harm your Dog?